How does one describe their first time to Africa? And then for the experience to be in Beautiful Botswana… not easy as it is really a place you need to witness with your own eyes. This awe-inspiring country was like nothing I had ever imagined, and thanks to Kwando Safaris and Eclipse Travel I was able to visit this magical place where my senses and mind was blown away every day. 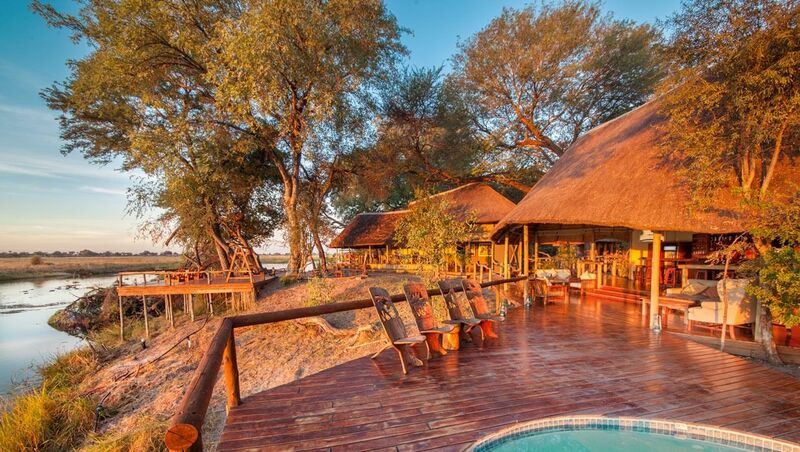 I spent five days with Kwando Safaris staying at four out of their six camps within their private game reserves of the Kwando Concession, Okavango Delta and Nxai Pan National Park. During my time, I saw a countless number of animals, too many to name all of them today but let’s give it a go. I was fortunate to see all of the Ugly 5 (hyena, wildebeest, vulture, warthog and the marabou stork). 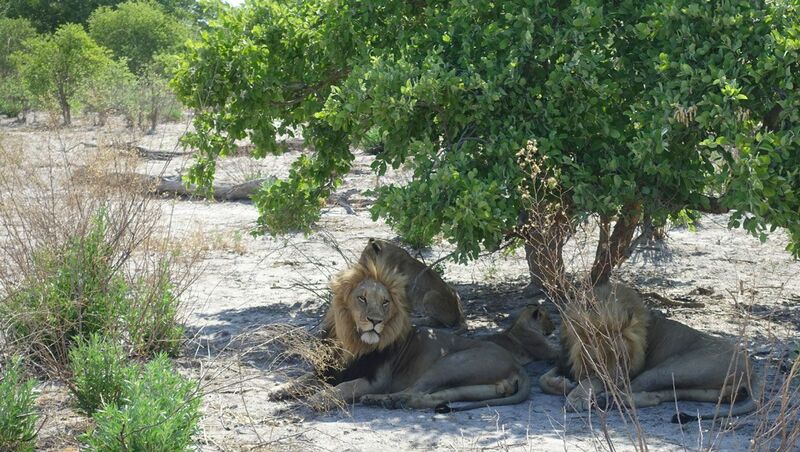 Three of the Big 5 (lion, leopard and elephant). I unfortunately missed out on the rhino and buffalo. One of the Shy 5 (porcupine) then some of the ones that don’t get a place in the Big, Little, Ugly, Shy or Impossible lists; hippos, impala, zebra (the national animal of Botswana); giraffe, tssebe; springbok, kori bustard (the largest flying bird native to Africa), jackals, baboons, koodoos, ostrich and a red velvet mite (or rain bug) to name a few. I have only ever seen some of these animals in a zoo, and watching them in their natural habitat gives you a greater respect and understanding of these animals. A herd of elephants gracefully walking by. The grunt and laughter of the hippos and the crackling and WHOooooOOPing of the hyena are things you can really only experience in the wild. I could go on and on about the abundance of animals but let me tell you about my trip; Kwando Safaris and their camps where I stayed. Day 1: After arriving in Maun airport from Johannesburg we were transferred to a light aircraft for the 30-minute flight to Kwando Safaris Lagoon Camp, where I was lucky enough to sit in the co-pilot’s seat. If you can get this spot do it – the views are amazing. When arriving at lagoon airstrip we were met by the guide and tracker and transferred by safari vehicle to Lagoon Camp where the managers and staff personally greeted us and provided much needed fresh icy cold towels. 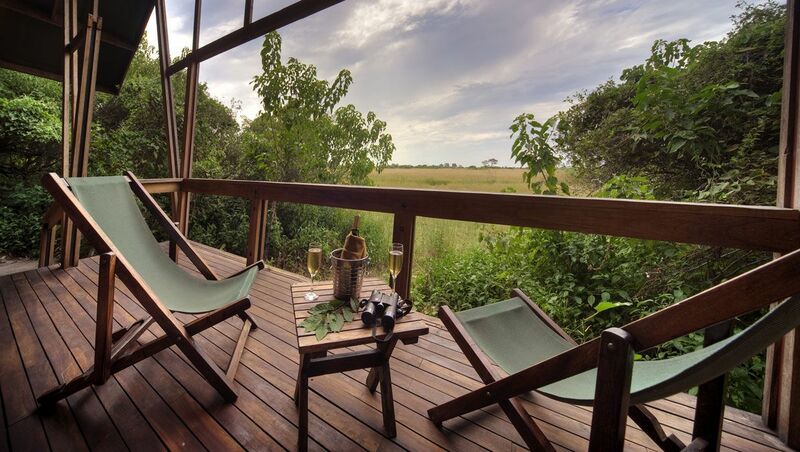 Lagoon camp is set on the banks of an oxbow of the Kwando River, the setting is remote and beautiful. For many months of the year, elephants can be seen drinking from the water next to the camp and you can witness the herds of buffalo that keep close proximity to the Kwando River. Large numbers of hippos can be seen here all day swimming in the river and wild dogs, lions, cheetahs, leopards, hyenas are not far away from their food sources. Over the years, many guests have been fortunate enough to see some of the incredible interactions between predator and prey. 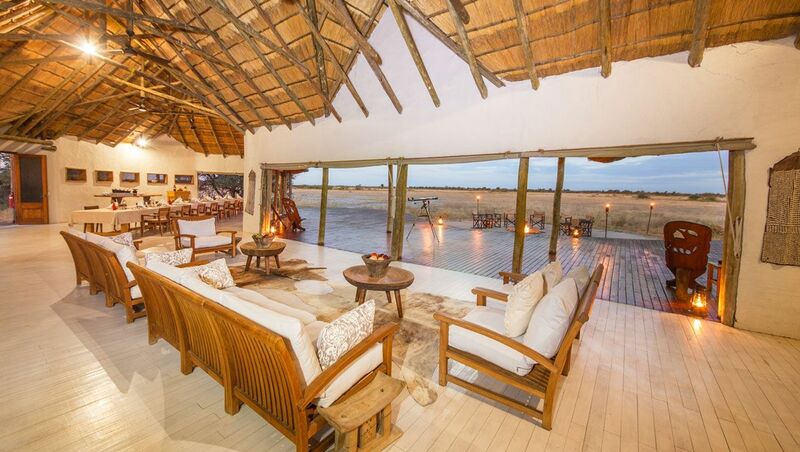 Because Lagoon is a vast private concession, they can offer game drives to operate both off road and at night. Many mammals are only active after dark, and this gives you a great opportunity to see some of them using a spotlight operated by the tracker. In addition to the game drives, they also offer boat cruises and walking safaris. We did the boat cruise in the evening with sundowners – the perfect end to the day’s safari. All the rooms at Lagoon have beautiful views overlooking the river and the Mudumu National Park in Namibia on the opposite bank. Each room has a private balcony on the banks of the river. The raised bedroom area leads to a dressing area and a large bathroom, again with stunning river views. There is a free-standing bathtub, inside shower, double basins, separate WC and an outdoor shower. Day 2: Our morning game drive took us south, stopping for refreshments at half-way and then continued northerly to Lebala Camp – our next destination for the night. Lebala Camp is hidden in the southern portion of the extensive Kwando wilderness, and is 232,000 hectares in size or 32 times the size of Manhattan! 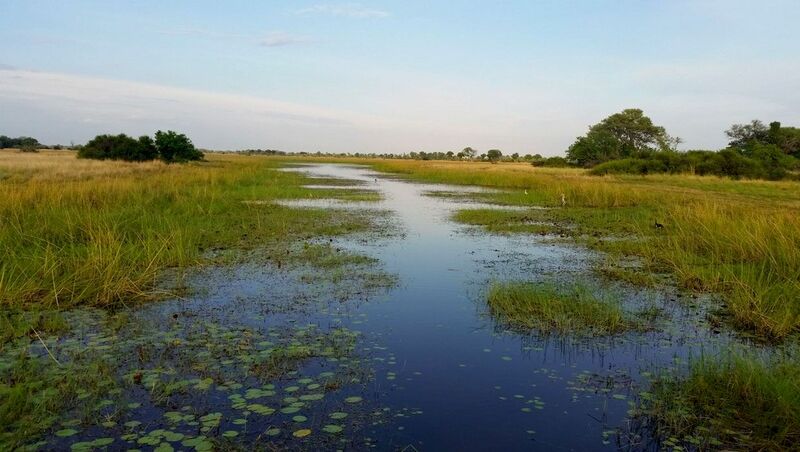 The word Lebala means wide open spaces, the area is a labyrinth of waterways, reed beds, islands, floodplains, bush, scrub and trees. The scenery here is spectacular and the concession is home to more elephants than the entire country of South Africa. This is hard-core game viewing country as they call it. I had many highlights here but none more than a hippo munching away in the front of my verandah at 2am; just awesome! The tents are spacious and beautifully decorated. You have access to the room via a sliding door on the private verandah. This leads into the sleeping area with a writing desk to one side and a small lounge area on the other. The bathroom has a free-standing bathtub, double sinks and leads out to double outdoor showers. All the tents have views of the surrounding floodplain. Day 3: After a morning game drive, we were transferred by light aircraft to Little Kwara. 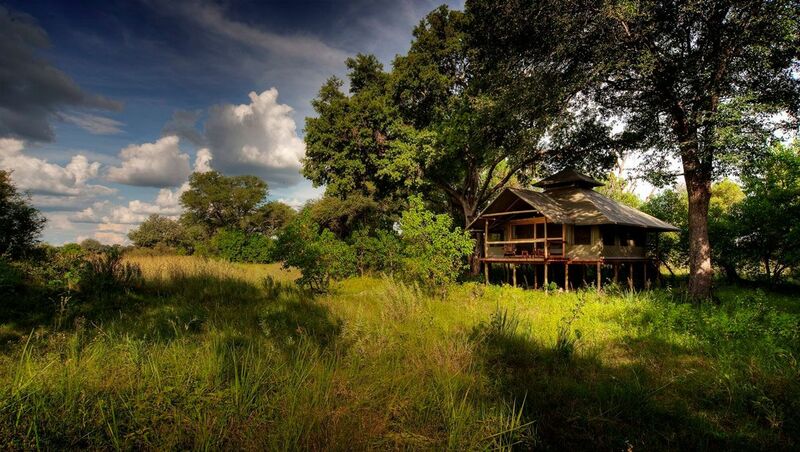 Little Kwara camp is on the edge of the permanent waters of the Okavango Delta and shares a common boundary with Moremi Game Reserve. The location of this camp is perfect, and allows Kwando Safaris to offer land and water activities including the Mokoro (a dug-out canoe). 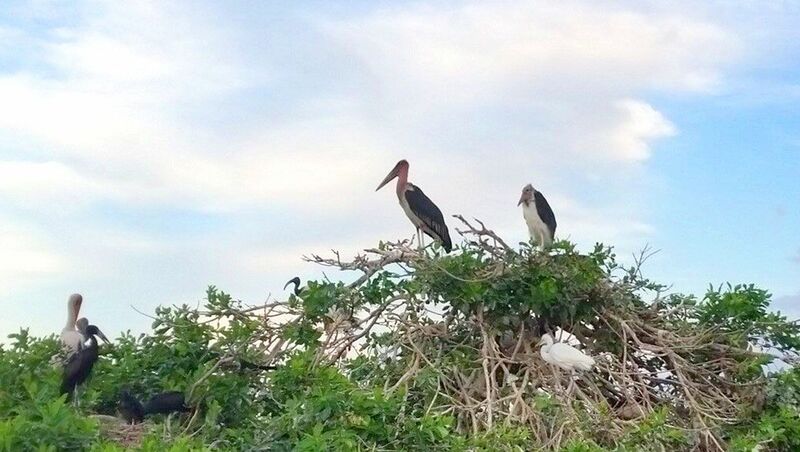 On our afternoon game drive and evening activity we chose the cruise along the Delta River where we stopped at an island that is shared by hundreds of different bird species. And let’s not forget our sundowners on the river. 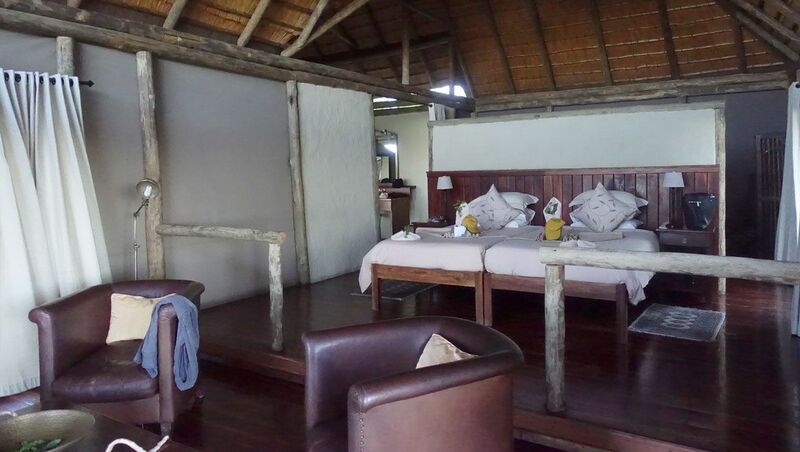 All the tents here are on a raised platform and the tents are spacious with a small sitting area in addition to the bedroom area and private deck. The ensuite facilities consist of a free-standing claw foot bath and an outdoor shower. 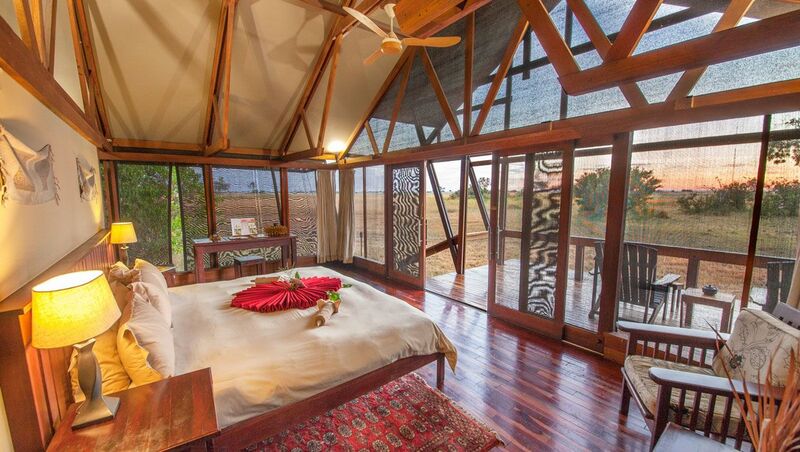 The tents are well spaced from their neighbours offering privacy and the opportunity to enjoy the peace and tranquillity of the surrounding bush during siesta time. Day 4: After our morning game drive, we were transferred by light aircraft to Nxai Pan. 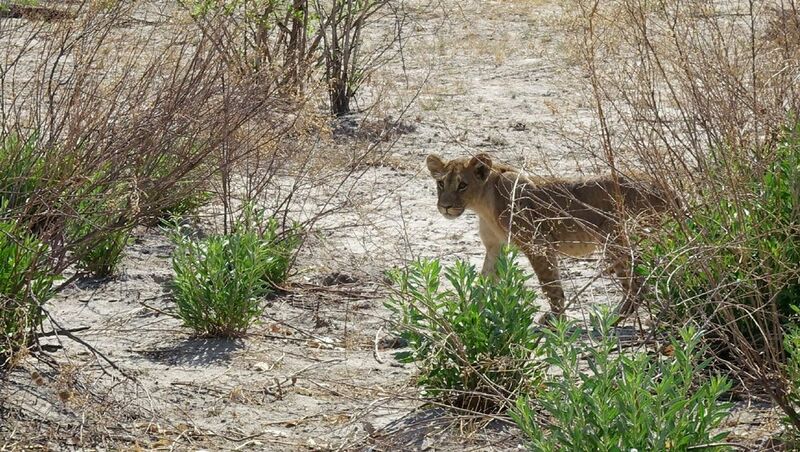 This place is vastly different to the others; Nxai Pan National Park lies just north of the Maun-Nata road and adjoins Makgadikgadi Pans National Park on its northern border. The camp is situated in the tree line with eight purpose-built desert rooms All of the rooms have private viewing decks, inside and outside showers and fans. The main area has a swimming pool, curio shop and library. 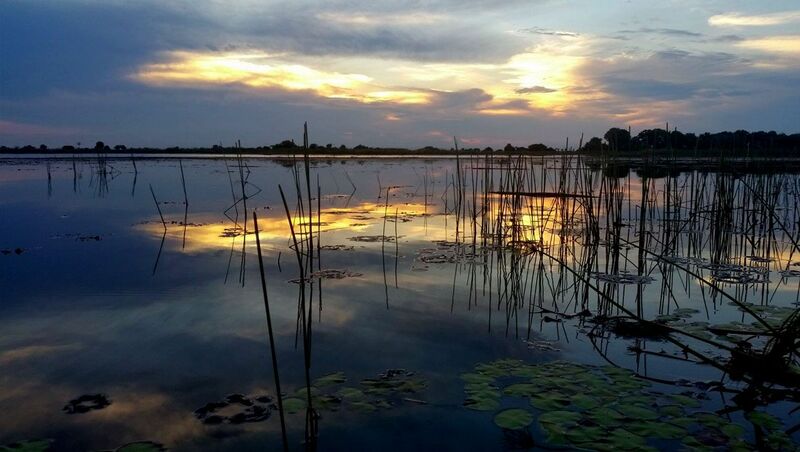 As Nxai Pan is a National Park and not a private concession, there are no night drives or off-road activities allowed but don’t let that stop you from visiting! Nxai Pan is well known for its huge springbok population and once the rains have started, gemsbok, elephants and zebras migrate to the region. At this time, zebras come in their thousands to drop their young at Nxai Pan. Extraordinarily large herds of giraffes can be seen with up to thirty in a group. The large herds of zebras, springboks, and wildebeest attract many predators such as lion, cheetah, jackal and both spotted and the elusive brown hyena, as well as the endangered wild dog and the secretive leopard. 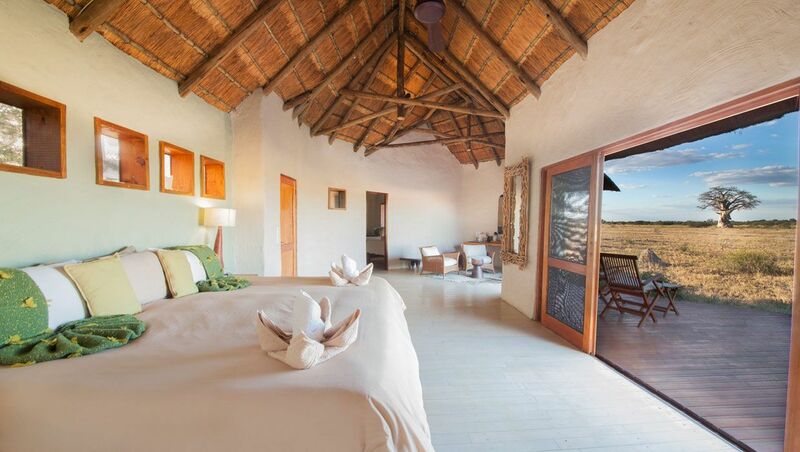 Activities here include a visit to Baines’ Baobabs, game drives, nature walks with the Bushmen and star gazing. Day 5: Our last day, and it was never going to be easy leaving this magnificent place -especially after our bush walk with one of the sweetest San ‘Bushman’ trackers “Shoes”. Yes, Shoes is his name. 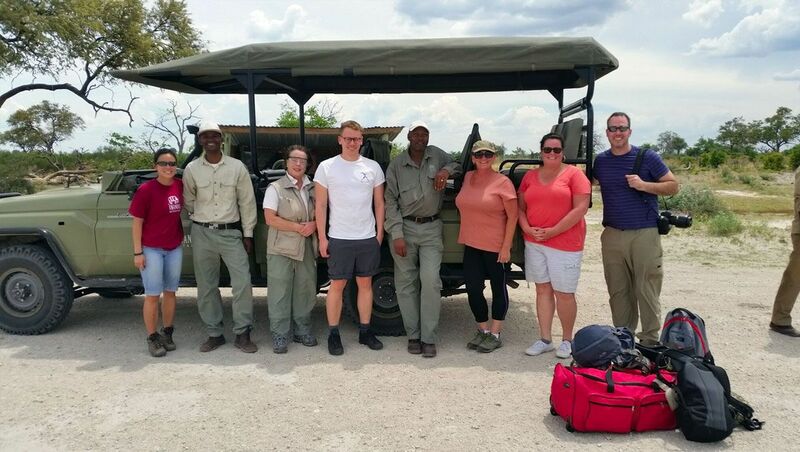 But, to our surprise a helicopter tour from Nxai Pan Camp to Baines’ Boababs was arranged with a picnic lunch and the excitement and smiles were back for all of us. 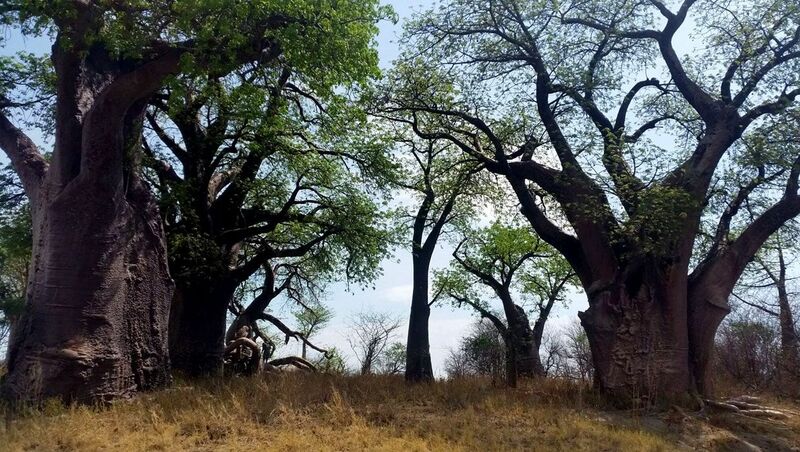 Baines’ Boababs is a group of seven giant Baobab trees located in the Nxai Pan National Park, named after Thomas Baines who painted them. According to sources, he completed the painting between 1861 and 1862 and Baines’ Baobabs have changed very little since the original painting. 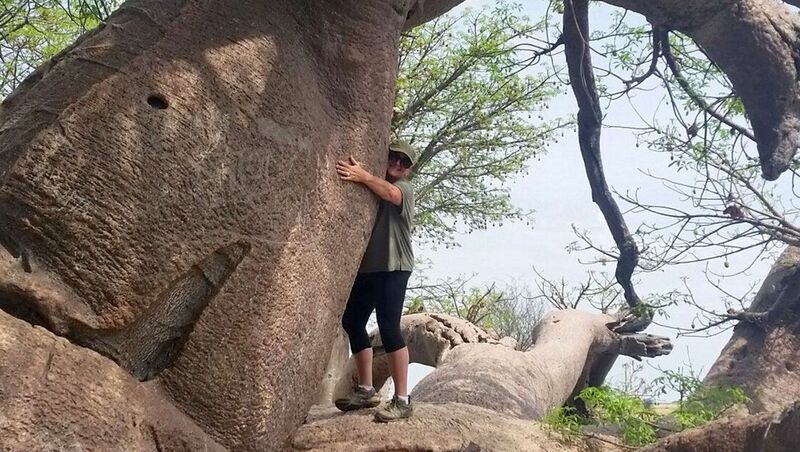 The Baobabs are located on a small island on the edge of Kudiakam Pan on the south side of Nxai Pan National Park which is a lovely area to visit on safari but I highly recommend visiting by helicopter. 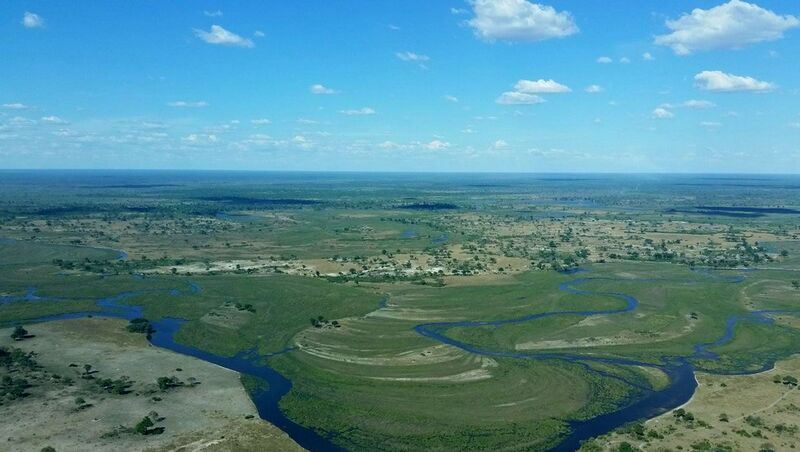 The scenery is absolutely amazing and truly the only way to see the salt pans of Botswana and the animals from the sky. After our picnic lunch, we returned by helicopter to the Nxai Pan Airstrip and bid farewell to our new Kwando family and friends. Before I finish off I just wanted to give you a little more insight to Kwando Safaris. 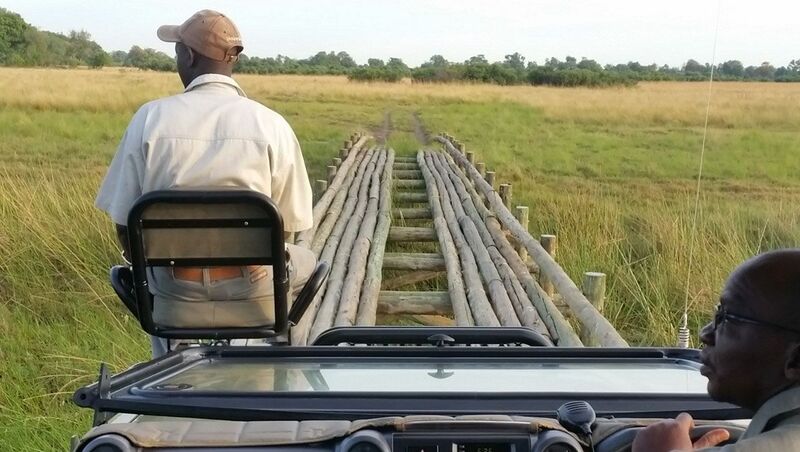 A day on safari consists of an early morning game drive starting at sunrise (5.30am) – the staff have hot tea and coffee, porridge and freshly baked muffins ready for you before heading out. The early morning is worth it, as it increases the chances of unusual sightings. After the morning drive/activity you return to camp for brunch which is shared with other guests giving, you the opportunity to chat about what you saw. After brunch is siesta, or swim in the pool like I did. Around 4pm it’s tea time where everyone meets again in the main areas for drinks and snacks before setting off on the afternoon drive and or boat cruise. At sunset, they stop at a scenic location for sundowners. 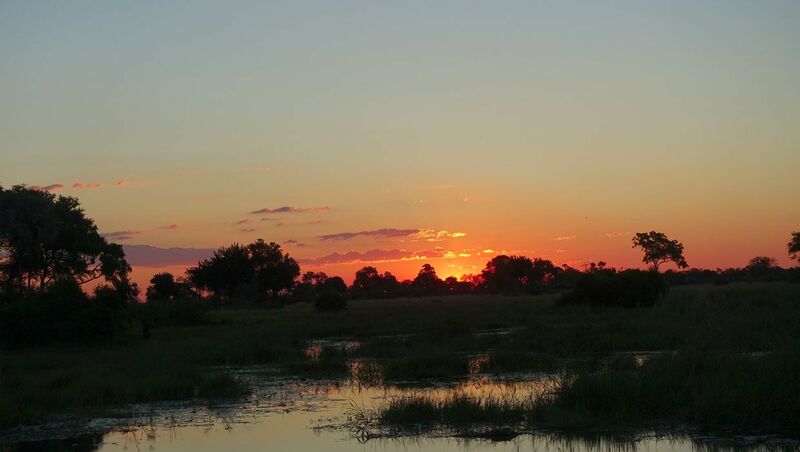 After watching the beautiful Botswana sunset, you continue with your night drive back to camp. When arriving back to camp settle in for evening drinks and a three-course dinner, finishing the evening around the open fire under the stars. All the Kwando camps are all-inclusive and offer nine rooms including a family room; except Little Kwara that has five rooms including a family room. 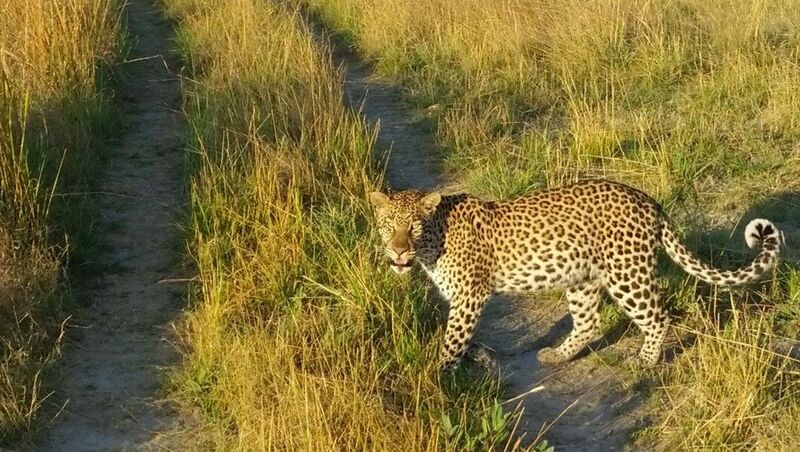 Kwando Safaris is also one of the only companies that offer a guide and a tracker together on every game drive which allows for two sets of eyes and ears for finding the animals. Having the two also allows the guide to be fully focused on the guests and sharing information while the tracker is still on lookout. I want to thank everyone one from Kwando Safaris for making my first trip to Africa so memorable. Your staff are amazing; intelligent and beautiful people that make you not want to leave and that I have missed every day since. So, I will just have to come back to visit. If you want to find out more about Botswana or any of the destinations in this article, or have any questions in general please contact us.